Whether you are listening to some tracks, or tracking your next recording, the KNS-6400 gives you the famous KRK sound independent of your monitors. This closed-back around-the-ear design brings you closer to your music, and the highly isolated surround pads give you the freedom to immerse yourself in the sound without having your monitor mix "escape" into open microphones and keeps live instruments out of what you are monitoring. 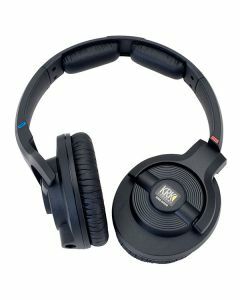 KRK Headphones provide a precise listening experience that takes you from personal studio to commercial studio to on-the-go track evaluations -- and they allow you to accurately enjoy your music with the consistent voicing philosophy and honest reproduction top producers, studio musicians, performers and engineers have come to trust. KRK headphones provide incredibly natural frequency response that gives you a reference standard unaffected by your location. Day or night. Studio or home. Without disturbing others. Without compromising your tracks. Passionate about music and interested in experiencing the artist's vision as it was intended to be heard? Then experience KRK.